M. Glenda Rosen and frequently speaks about writing mysteries and growing up as “the gangster’s daughter.” Numerous articles by her have been published in Mystery Scene Magazine, Sisters In Crime Newsletters, and mystery blogs. 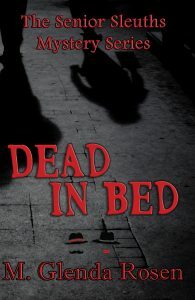 She has previously published four books in her first mystery series, “Dying to Be Beautiful.” She is also author of “The Woman’s Business Therapist,” and the award-winning “My Memoir Workbook.” She is a member of Sisters in Crime, Board Member, Woman’s National Book Association, Central Coast Writer’s, Public Safety Writer’s Association and The Mob Museum. To contact the author directly, e-mail MarciagRosen@gmail.com.